On January 15, 2017 The ORWW PEAS Project Website Became 20 Years Old! January 15, 1997 PEAS Project website is uploaded to the Internet. 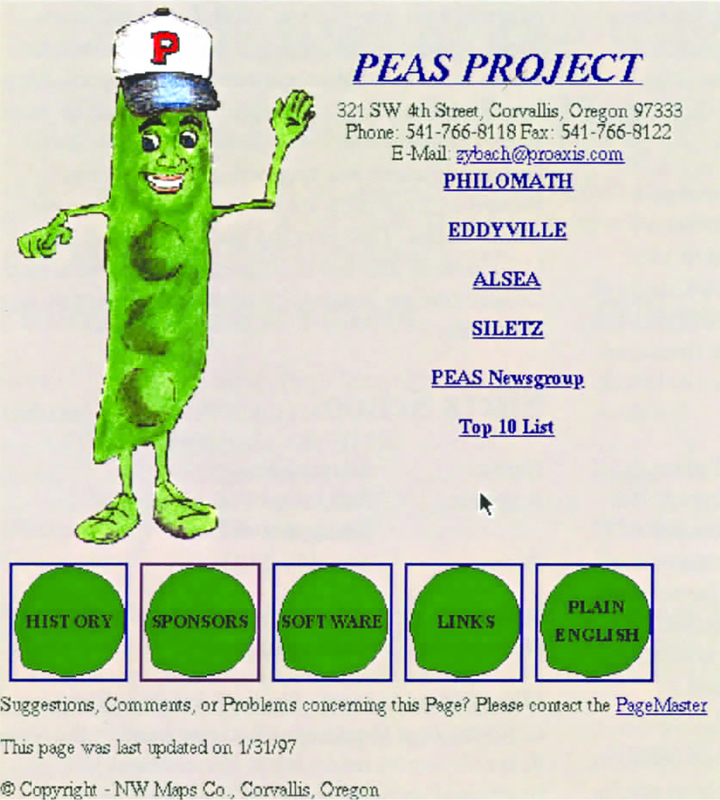 January 31, 1997 The first issue of the PEAS Pilot is distributed as an 8-page hardcopy newsletter mailed to sponsors, student, and teacher participants -- and simultaneously uploaded to the PEAS website in icon-driven/Plain English HTML format as ORWW's first Internet report. 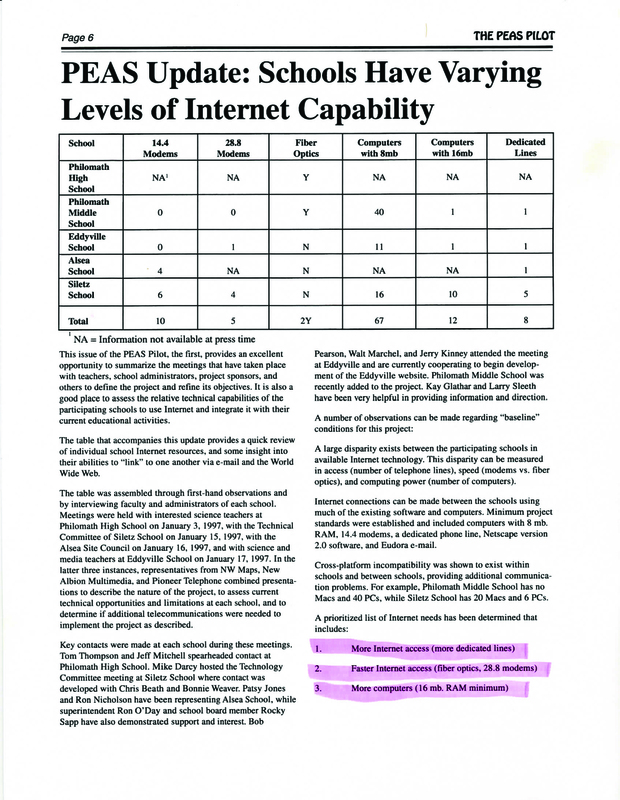 January 31, 1997 PEAS Pilot #1 newsletter and PEAS Pilot website both feature a systematic survey of the five PEAS schools regarding computer hardware, software, & Internet connectivity. These results seem typical of most rural Oregon schools at that time. February 1997 Newport News-Times "Eddyville and Siletz Schools Chosen to Participate in Pilot Internet Program." Sharon Seabrook interviews key personnel at Eddyville and Siletz Schools regarding their participation in the PEAS Project. 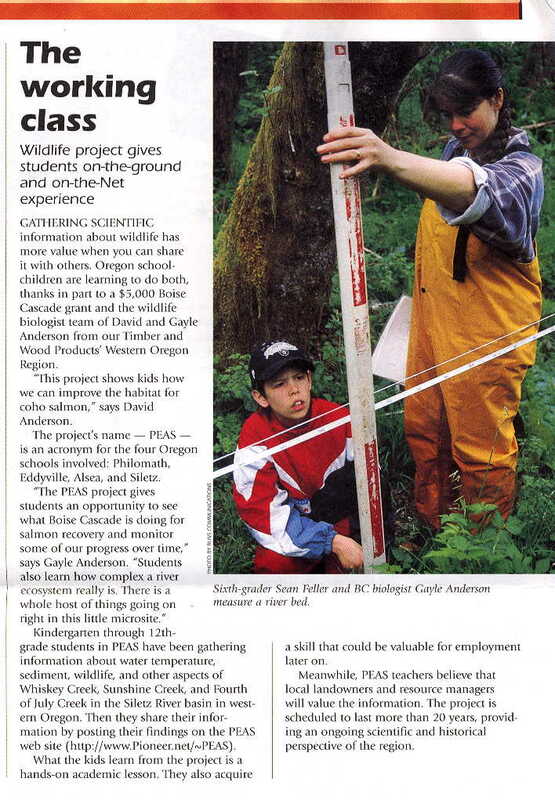 March 1997 Pioneer Telephone Inside Line "Learning With the Internet Through The PEAS Pilot Project." Describes Alsea School teacher Ron Nicholson's thoughts and philosophy regarding his school's participation in the PEAS Project. March 15, 1997 The second newsletter, PEAS Pilot #2, was mailed on March 15, 1997 & uploaded simultaneously as a PEAS Pilot online report on March 20. This issue featured the student-written environmental sciences reports for each of the five PEAS schools. June 6, 1997 First live Internet news broadcast by PEAS network, reporting on PEAS Awards ceremony at Philomath High School, honoring and rewarding more than 40 students from seven schools who made the Project a success. June 6, 1997 The third newsletter, PEAS Pilot #3, was distributed during the PEAS Award Ceremony on June 6, 1997. It was mailed the following days to participants unable to attend. This newsletter is a summary of the PEAS Project accomplishments & lists the students, teachers, administrators, sponsors, & supporters who helped make the project possible & successful. 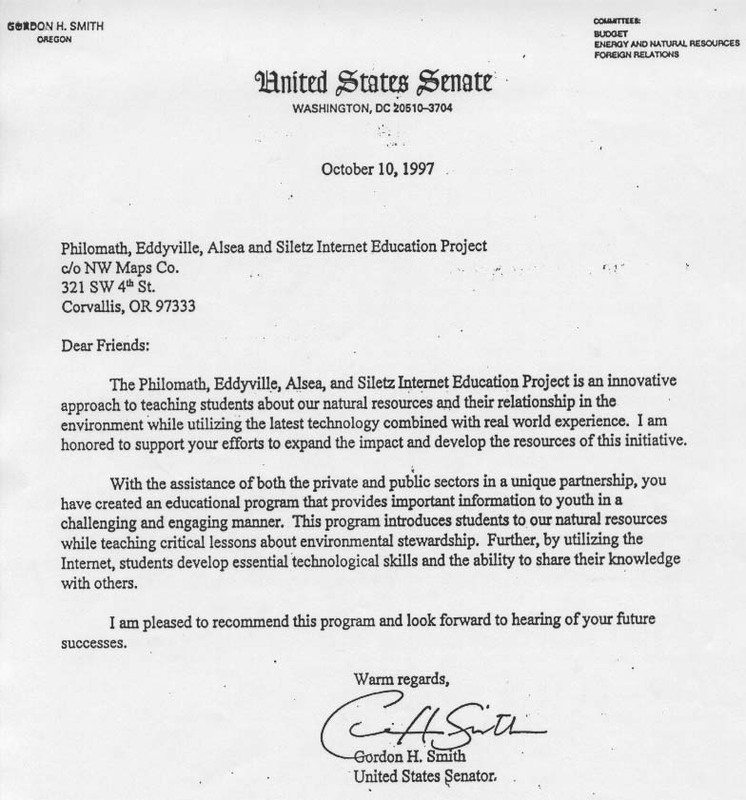 October 10, 1997 Letter of support from Oregon Senator Gordon Smith: "The Philomath, Eddyville, Alsea, and Siletz Internet Education Project is an innovative approach to teaching students about our natural resources and their relationship in the environment while using the latest technology combined with real world experience. I am honored to support your efforts . . ."
May 6, 1998 Newport News-Times "Students Plan Siletz River Projects This Week." Reporter Sue Lick describes Siletz School transition from PEAS Project to first Classroom on the Siletz River Day. September 17, 1998 Letter of Support from Oregon Senator Ron Wyden: "I visited the PEAS website and was extremely impressed. The PEAS Internet Education Project is an innovative way to train children to utilize technology, while teaching them about our natural resources and our environment." Fall, 1998 BoiseCascade Corporation BC News "The Working Class." Describes activities of Boise Cascade wildlife biologists cooperating with Classroom on the Siletz River Day students. Notable quote: "the project is scheduled to last more than 20 years . . ."
May 6, 1999 KATU TV Channel 2 "Outdoors With Grant McOmie." Portland television crew spent the day of April 28 documenting the 1999 Siletz River Day event; the culmination of the second annual Classroom on the Siletz River Day. May 6, 2000 Newport News-Times "Siletz River Day a Success for Third Year." The 2000 Siletz River Day became the last planned event of the PEAS Project & Classroom on the Siletz River Day, due to retirement of Siletz Principal Mike Darcy & to major budgetary reorganization of Lincoln County School system. © 1996-2017 Oregon Websites and Watersheds Project, Inc. & NW Maps Co.